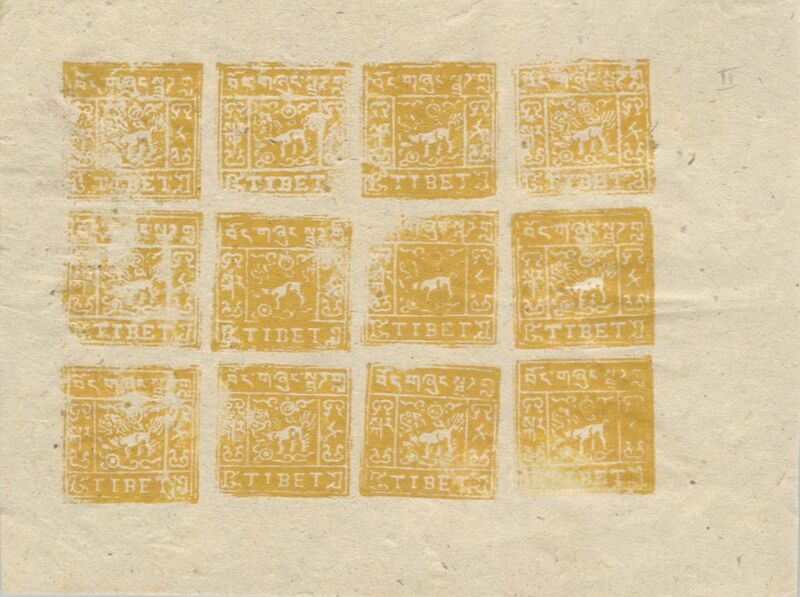 One of the main characteristics of the 1933 issue of Tibet are on firstly the several settings in which these stamps are printed over the period of time of use and secondly the very many different colour shades. Waterfall and later on also Dahnke lists these shades in their handbooks, however, some other minor shades still exists and it is difficult to say if they are new colours or just very minor colour differences due to the locally made paper which gives a different appearance of the shade. The shown sheet which I have won at an auction recently was offered as having the rare colour shade ochre, a shade every Tibet collector is hunting for. When the sheet had arrived, at first I had been disappointed since the sheet did not have the shade as expected. However, a closer examination showed that the sheet has a so far unrecorded colour which is, based on Methuen Handbook of colours, the colour handbook used by Tibet collectors, 5D7/8. I am in possession of the original notes of the late Tibet collector and examiner, Mr. Kurt H. Dahnke, in which he has recorded all shades he run across during his time but this shade is not mentioned there. If this is an important new discovery or not, well, the time will show if more sheets or singles stamps and multiples will be found. 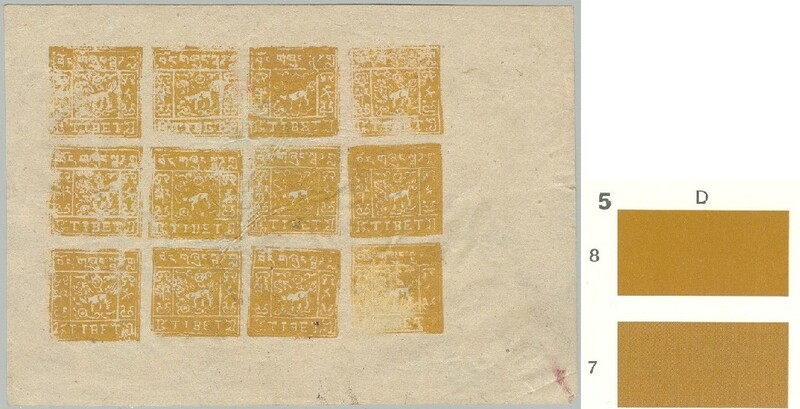 I have now received a similar sheet with this color shade... and several collectors have expressed their opinion that the shade is in fact the yellow-bistre shade as described by Waterfall. Who is having a shade in his collection with color code 4B6?